Sucker Punch is billed as an ‘action/fantasy/musical’ and is soon to hit the screens of cinemas up and down the country. Sucker Punch is an action/fantasy/musical and like nothing you’ve ever seen before by the crew behind Watchmen. Baby-Doll (Emily Browning) has been locked up in a mental asylum but is not going to go without a fight. With her imagination on over-drive, and with the help of some of her fellow inmates, she is out to conquer the world, a world that is fantastical and probably imaginary and includes dragons and knife-wielding bandits and anything she can fantasise into existence. 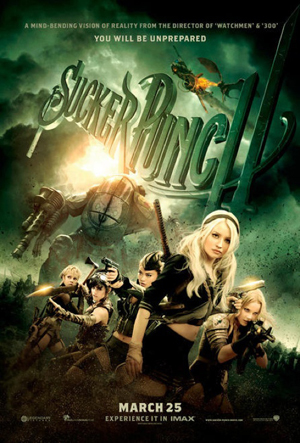 Snyder, the director, has called Sucker Punch Alice in Wonderland with machine guns, and it’s certainly quite a ride! Admittedly I am a little unsure of what to make of this from the trailer – on one hand it looks quite disturbing and dark (which you’d expect from the team behind Watchmen I guess) but then about half way through it all goes a little bit cuckoo-bananas and goes all fantasy on its bad self! Now, don;t get me wrong, I am a huge musical and fantasy geek, and so really was looking forward to this film, however at present it just seems a little bit ‘odd’. I’ll no doubt end up going to see this film on my Unlimited card with Cineworld (especially as the new Transformers movie is one of the trailers in cinemas), but am not sure if I’d actually pay to go see it, and would probably just pick it up on DVD when it slides into the <£5 section if I am honest. Of course, my opinions are based purely on the trailer, and I’ve yet to hear any of the musical songs from the film (they’re making a big deal of how integral the music and choreography is to the film, though my understanding is that this is not a musical in its traditional form), therefore it may be so bizarre that it ACTUALLY works, who knows – only time will tell! Sucker Punch is released in the UK on April 1st 2011.